Ceratanium was introduced just last year in 2017 with the IWC Aquatimer Perpetual Calendar Digital Date-Month watch, so it is still relatively new. Apparently, the material is naturally the matte black you see here, and we may not be seeing a range of colors as we do with good old ceramic. To create it, if I understand correctly, a certain high-purity titanium alloy is first machined into its final case and component shapes, and then it is baked in a furnace where “oxygen diffuses into the material,” and this finally causes the surface of the metal to transform into ceramic. 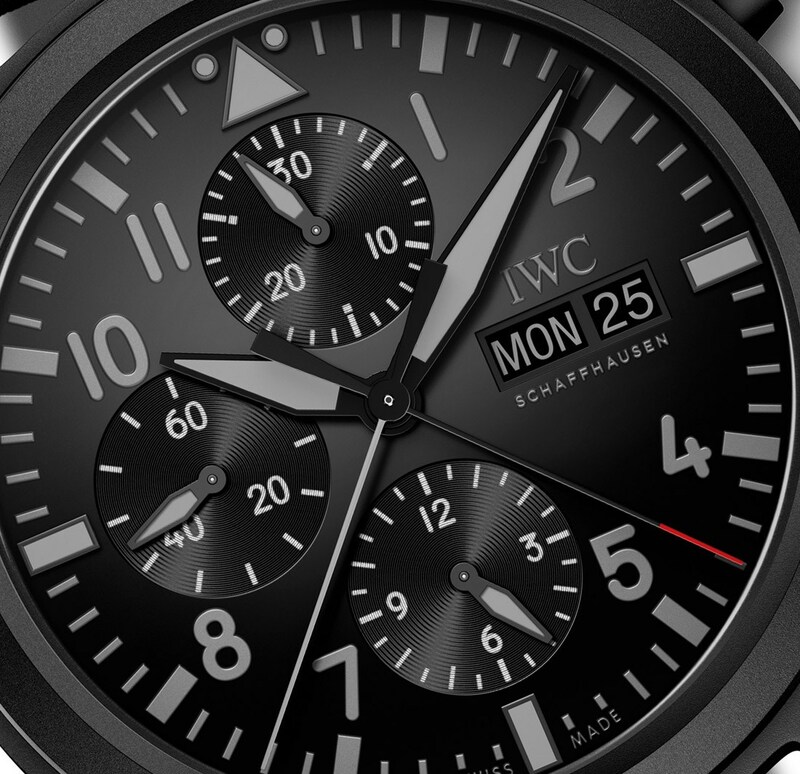 This is not a coating and will it not separate from the titanium beneath, even with a hard knock, according to IWC. Why did IWC feel the need to make Ceratanium? Ceramic and titanium are both celebrated watchmaking materials, both being pretty light and hard. But each has their Achilles’ Heel. Ceramic can actually break with hard impacts, and titanium tends to scratch easily even though it is extremely hard. 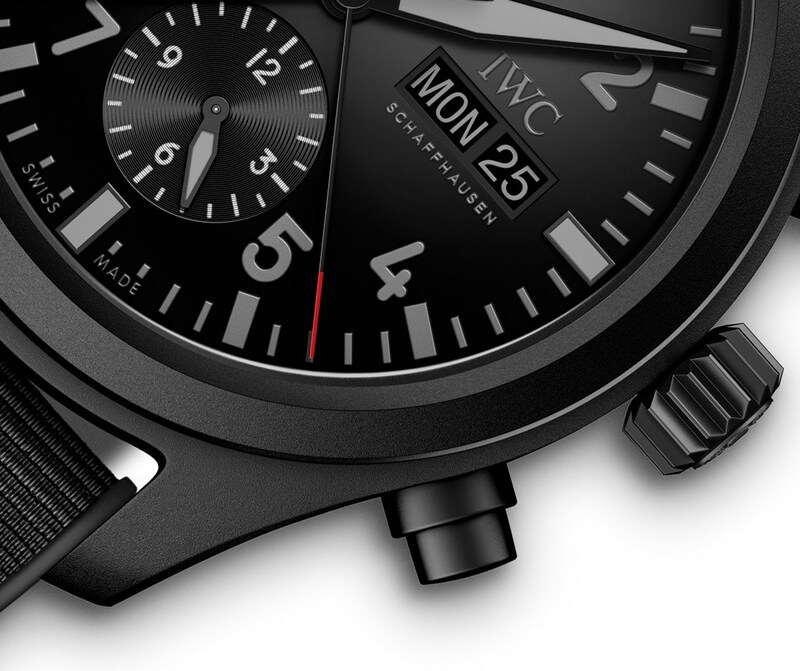 So, we are told that the structural integrity of IWC’s titanium alloy inside will make the resulting material essentially unbreakable, while the ceramic surface will be impervious to scratches. Further, this seems a superior solution to black coatings like DLC which can still scratch and flake off – personally, I tend to be wary of coatings in general. IWC says that Ceratanium’s ceramic outer layer is integral to and “adheres permanently” to the material beneath. As long as it does what IWC says, I’m convinced that there was a valid reason to make something like Ceratanium. 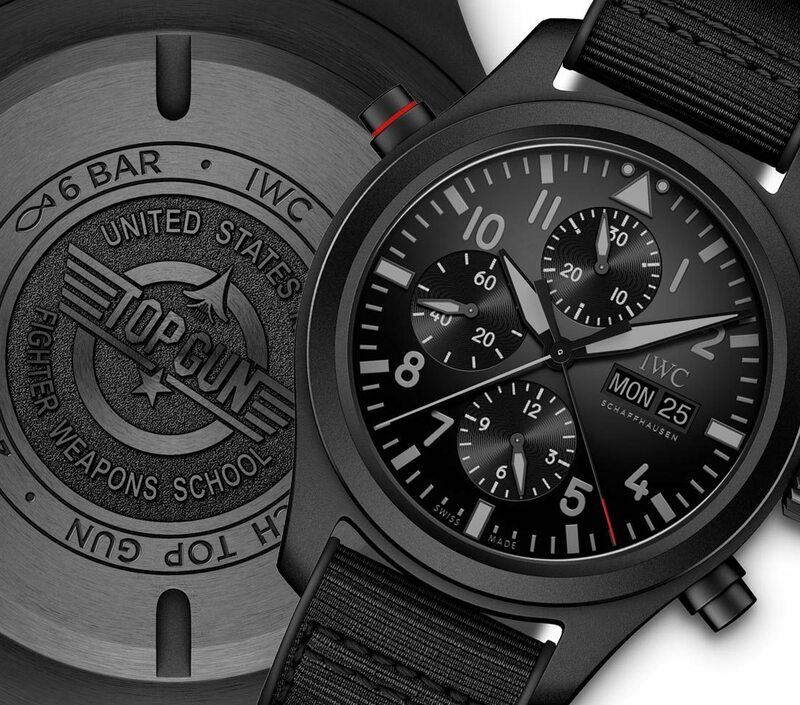 The IWC Top Gun watches are intended to be durable to fit their military theme, taking the Top Gun name from the U.S. Navy’s Strike Fighter Tactics Instructor Program, so the material is a good match for that. Speaking of the name, both “Ceratanium” and “Double Chronograph” make this watch feel a little exotic. Double Chronograph refers to a split-second variety of chronograph which means you can time two events at once using the two seconds hands – at least up to a minute. 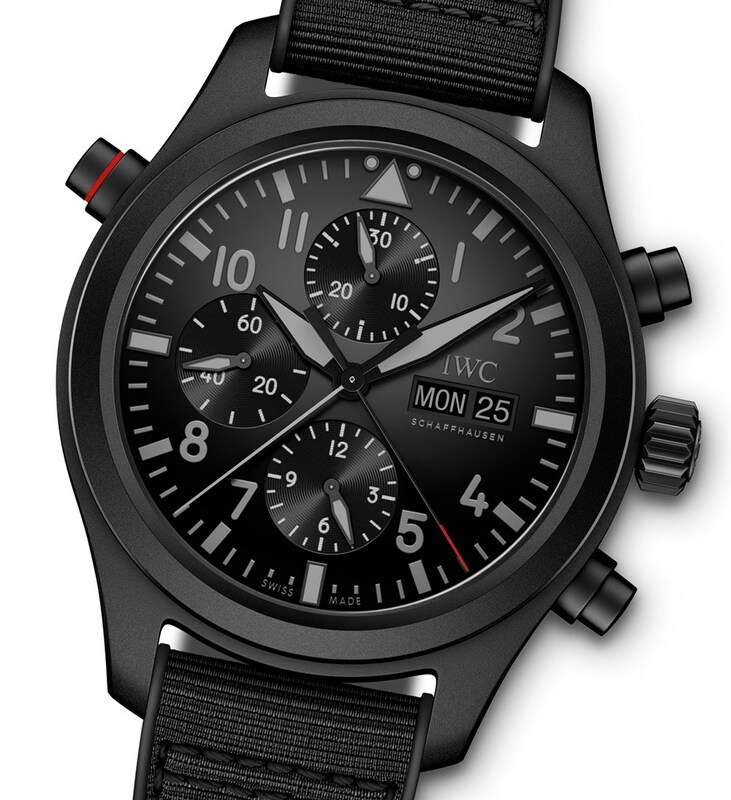 This is naturally a more complicated and less common type of chronograph, and it is powered by the IWC manufacture 79230 automatic movement with a frequency of 4Hz and power reserve of 44 hours. 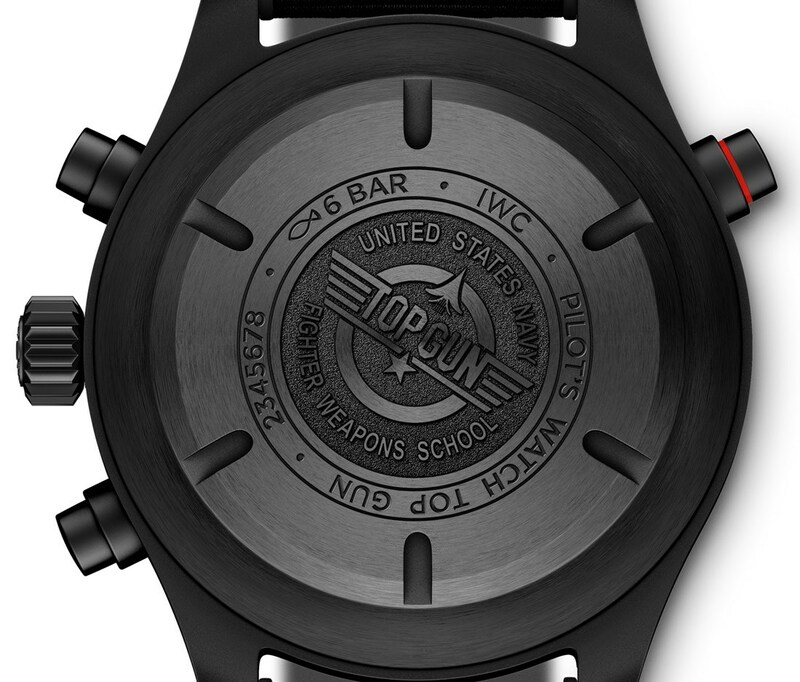 It will be hidden behind a solid Ceratanium caseback with the Top Gun engravings. Components such as the pushers and pin buckle are also black Ceratanium and black ceramic is used, I believe, on the dial. With mostly gray against black, it seems that contrast – and therefore ideal legibility – lost out to a hip “phantom” or “tactical” look. Maybe it will be more legible in person, but “invisible visibility” (did I get that right, Mr. Biver?) has not yet convinced me that it has a place on watches. The 44mm-wide and chunky 16.8mm-thick case is water-resistant to an uncommon 60m, and it comes on a rubber strap.